Seems like the cat fighting has officially begun and the subjects are Chris Brown’s current girlfriend Karrueche Tran and his ex Rihanna! She was obviously referring to the famous love triangle between Brad Pitt, Angelina Jolie and Jennifer Aniston, in which Brad ultimately chose Angelina. 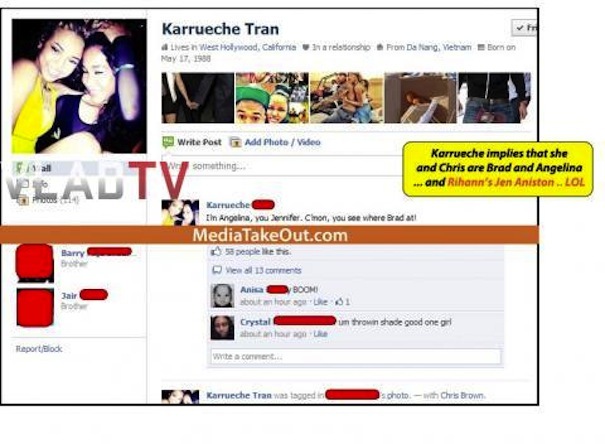 The post was later deleted after Karrueche’s profile began getting flooded with friend requests, but she didn’t hide her feelings about the situation. Hot Damn! It seems like Rihanna’s remix to “Birthday Cake” featuring C Breezy has everybody’s emotions flying! The lyrics are a little racy and would’ve had us a little insecure too. 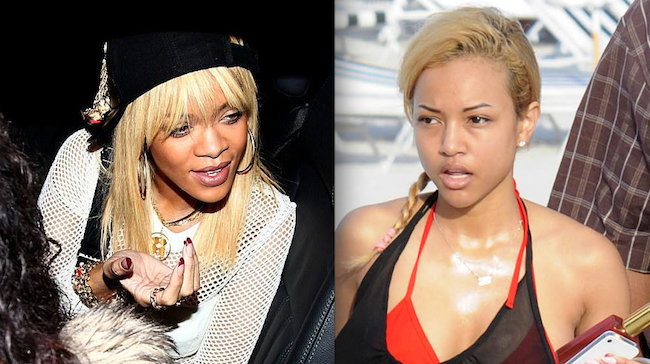 We will say one thing….Karrueche may be itty bitty, but she ain’t no punk! This entry was posted in Entertainment News and tagged Birthday Cake, cat fight, Chris Brown, ex, girl fight, Karrueche Tran, love, love triangle, lust, relationships, Rihanna. Bookmark the permalink. 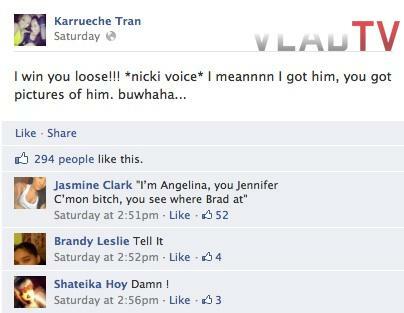 It must be hard for Karrueche. Her boyfriend’s ex is everywhere, coupled with the rumors. I probably could not handle that. But it seems like she handling herself well.